Professional chauffeur driven executive car hire. The idea wedding cars for your perfect day. Arrive in style with one of our high end limousines. 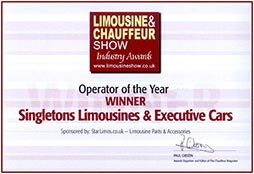 Since being established in 1994 Singletons Executive Cars have gained an enviable reputation over the years for our efficient and courteous service. During this time we have increased out fleet size to 29 vehicles of various models and sizes, ranging from luxury Executive Cars and MPV’s, to highly prestigious Wedding Cars and Limousines. Operating from our base in Bridgend, South Wales, we cover any U.K. destination. Our experienced chauffeurs are carefully vetted and fully CRB/DBS checked. Our drivers and vehicles are fully licensed and checked by the Local Authority as required by law. We ensure our clients travel in style and luxury, our vehicles offer everything you could possibly require for a comfortable and first class experience with VIP treatment on every occasion. Our uniformed chauffeurs will be happy to provide the personal touch and tend to your every need in order to make your occasion extra special. If you use a Limo Agency you run the risk of not getting a limo from a licensed, legitimate operator. Agencies don’t need to register with anyone – they simply take inquiries and then look to find the operator who will do the job at the very cheapest rate in order to make the maximum profit for themselves – once they pass the work on to an operator that’s them finished with the job – and you left hoping your limo will turn up. 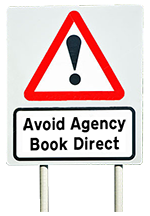 For example, if you pay an Agency £250 for a booking, the operator will likely be doing the job for £60 to £80 less (that’s £60 to £80 the agency keeps) so don’t expect the works! Don’t take the risk – book direct – get a fully licensed service and 100% value for money! Many thanks for the gorgeous limousines and first class service on our wedding day. it really made our special day that bit more wonderful. I will definitely be recommending your service in the future. Thanks again. Thank you for the quality of service we received from Singletons on both outward and return journey to London. Our train was over 3 hours late and were pleased to see you waiting for us to get us home. Each member of our party have asked to pass on their thanks. On behalf of all children and adults at Tondu Junior RFC we would like to thank you for your kind and generous donation of a trip in your grand “Jeep” limousine to our auction. Thank you so much for all your help in arranging the limousine hire last Saturday. Everyone of our guests have contacted me to pass on their thanks for the excellent service and high quality vehicle supplied. Hopefully we will be hosting future hospitality events in Cardiff and will be in touch to arrange further hires. Thank you for bringing the limo to my school on the 4th july it made my birthday very special. Thank you for the wonderful service you gave when you took my parents to the Farmers Arms to celebrate their golden wedding. Your driver was very obliging and courteous and went out of his way to please. I shall certainly recommend your company to friends and I know my parents will never forget the occasion .